All these lectures will take place at Hendon Library, The Burroughs, N. W. 4,with coffee at 8pm and the lecture following at,8 .30 . Billingsgate Dig The viewing gallery, is still open and may continue so for some time best ring the publicity office at the Museum of London (600 3699) before visiting, to check times. First, on the editorial side, thanks to the four associate editors, each of whom have put a couple of issued to bed during the last year, Liz Holliday, Enid Hill, Liz Sagues and Isoble McPherson. Some of them cut their own stencils (that's a double bonus, worth double thanks) while those who don't type have had the services of expert and kindly typists whose help has been most gratefully received, Deirdre Barrie, Joan Wrigley and Phyllis Fletcher. Jeremy Clynes and Enid Hill, between them, have masterminded the distribution side Jeremy up to May 1982 & Enid since then, That job involves a lot of ferrying to and fro, helping to keep the mailing list up to date and dealing with the production of illustrations. Raymond Lowe has been responsible for housing our addressograph and, helped by his family, preparing the envelopes - over 400 of them 12 times a year. Toughest part of that assignment is altering the stencils when new members' names are added or old members change their addresses. Rolling off stencils with an .average of 8-10 pages per Newsletter, and sometimes insertions - takes five to six hours, while collating, folding; stuffing and stamping the envelopes is a good two days work. free time to producing this minor monthly miracle. and for that long and reliable service HADAS is greatly in his debt. After an instructive visit to the exhibition of prints, post cards and memorabilia, upstairs, we came down: for the supper. Those of us seated' in the paneled Music Room got to know each other more closely than ever before', through double doors we could see our fellow diners seated at separate tables in the Hall, and hoped they 'could hear Christopher Wade’s interesting talk as well as we could. He; gave a fascinating account of the history of the house and of the' foul-tasting waters which attracted visitors to Hampstead in the eighteenth century. The supper itself was a great success, although some of those present found the choice between Sherry, trifle and mince pies an agonising: one ! The group will be happy to hear from members interested in documentary research,of all kinds - in the LBB Local History Collection at Egerton Gardens, at the Newspaper Library at Colindale or in other record offices and libraries further afield, Again, please. Let Brigid know if you would like to help. A group of HADAS members visited the Verulamium Museum one Saturday recently Those of us who arrived early and eager enjoyed a conducted walk, led by Jenny .Griffiths, encompassing `the Hypocaust, with its splendid mosaic floor, diagonal channels for underfloor heating and box flue tiles in situ, Then on to the foundations of the Roman Gateway and road leading to London, via Brockley Hill and known as Watling Street. We admired the strength of the Roman Wall and bastions that have defied the centuries and were equally impressed by the huge ditch and bank defences, .at the S.W. corner of the old city. Hurriedly we retraced our steps over grassy pitches which cover the hidden foundations of Roman streets, glimpsing the majestic scene of St Albans Cathedral over the lake in the distance. pottery that afternoon than we could have done from any book. been found this time under a .hedge. Here, as promised in the November Newsletter, is another bulletin of 'Committee news. Donations Each year the Society .makes a small donation. to a good cause - it's never much, but it gives the feeling we are helping.- In the past we have contributed to such projects as the Painted House at Dover .and the: Salisbury Museum appeal, This Year's cause almost picked itself it's an industrial archaeology project our own Borough - the new Bomber Command wing of the RAF Museum. from the Mary Rose Appeal. Fund. Publications The Society has been falling behind with its publishing we haven't produced anything since Percy Reboul's Those Were the Days in February 1981. Now a new publishing sub-committee has been. set-up to plan a further, programme, Victor Jones chairs it, and Enid Hill, Ann Kahn, Pete Griffiths and Brigid Grafton Green sit on it, with Camilla Raab as an interested helper on the editorial side. It has been decided to let one of our early publications - Money, Milk and Milestones , of which stocks are virtually exhausted - go out of print and, as a first step to replace it with a new miscellany taken from the Newsletters of 1977-82...Other booklets,- we hope will follow, Jeremy Clynes is ,bowing out soon as organiser of publication and distribution - both our own booklets and Shire publications Pete Griffiths has kindly agreed to take over the job, and is in the process of acquiring the know-how. Digging up the Past The course which HADAS arranged at the Hampstead Garden Suburb Institute under this title finished last month and was most successful. Student numbers kept up well throughout the course (that's often a problem with adult education) and student’s comments and questions showed real interest. John Enderby, the Institute's Principal, reckons that some participants have, become hooked on archaeology. .
With kind permission of the Club Secretary, I have recently been able to watch the digging of foundations for the new sports pavilion for the Crusaders football club at Church Farm, East Barnet. The church is situated at the summit of a low hill of glacial gravel. A cursory visual inspection suggested that the area. to the south and west of the church had been built up and terraced in order to increase the area available for building. The building excavations consisted of the digging of thirty holes, about 0 6m square and 1 2m: deep, which were subsequently filled with concrete to provide pile foundations for the. pavilion. Near the church the top soil was quite shallow, and was immediately succeeded by glacial gravel,. A few metres further away there was evidence of dumping, presumably to flatten the site:with a layer of older top soil preserved beneath the dumped material, This deposited material consisted of clay and top soil, but also contained a considerable amount of brick rubble .and slate The presence of slate fragments, combined with sherds of typically Victorian pottery in the rubble layer; suggests that the dumping occurred in the nineteenth century. One of the most southerly line of pits revealed a brick structure about 1 metre below ground surface. Although it was not possible to investigate the nature of this structure, it seems most likely that it was part of a brick drain, similar, to those recently found by Percy Reboul at Cedars Close, Hendon, Such a. drain could also be plausibly of nineteenth century date. Examination of the spoil from the pits revealed traces of brick;and slate rubble, and 19th century pottery, but no material of earlier date. There was no trace 'of any structures in the buried soil layer, which appeared to have been normal plough soil, without evidence of a worm-sorted zone. 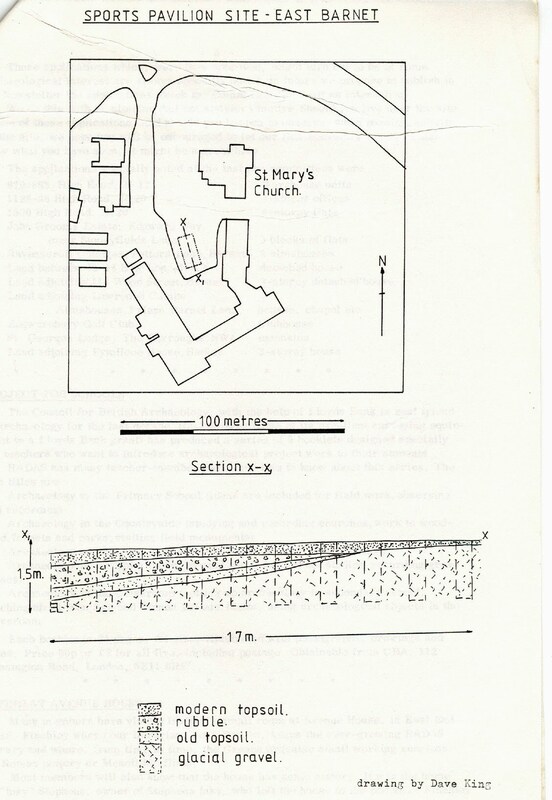 The evidence of the present excavations suggests that the area immediately south of the church has been considerably disturbed in the last two centuries, and so may no longer contain traces of Medieval occupation. Those applications which, were they approved, might turn out to be of some archaeological interest are always specially noted. In future we propose to publish in the Newsletter the applications which the Committee picks out as interesting. Archaeology in the Classroom (setting up archaeology in secondary school, teaching about Iron Age and Roman Britain, books, using archaeological objects in the classroom. on Roman pottery or Mesolithic flints. when he died in 1918. Mr. Mann,' presides over the small office in the main hall of: the building) his latest discovery - a fine stained glass doorway leading from the office into the back of the hall. Until a few weeks ago the glass panels were, covered with, asbestos sheets, as part of the fire regulations; and the glass itself, grimed with the dark brown film of ages, looked nondescript. Now Mr. Hudson has removed some asbestos (more is still to come down at the time of writing) and he has washed the glass; and behold, there are the stained-glass` upper panels of a pair of double doors, with a large stained-glass half-moon fanlight above. With the light behind, all the colours of the rainbow come through. Set in the fanlight are three crests: ra pair of lions, an' eagle-like bird and two small birds. Paddy Musgrove, who has delved deeper than anyone into Avenue House history, thinks the eagle is Stephens' own crest and one of the others is probably, Mrs. Stephens' - she was an O’Reilly from Ireland. Could the two small birds be two finches of Finchley? Paddy also tells us that he has recently found new and interesting documentary material about Stephens and his various interests. The rain poured down-steadily on the 12th December as four stalwart HADAS members splashed their way northwards along the Silk Stream, sometimes in the stream itself and sometimes along its banks. This was a continuation of the walk described in the last Newsletter and covered the area from Montrose Avenue toWatling Avenue at Burnt Oak. The Stream meanders pleasantly across the park which bears its name and there is the usual flotsam and jetsam, none of which has so far proved to be of archaeological interest. Just south of the culvert under Watling Avenue, the stream is joined by a small tributary flowing in from Watling Park. Does anyone know its name (None is shown on the 0:S.map. The tributary seems to have been the main watercourse of the land belonging to Goldbeaters 'Farm and it passes close to Thirleby Road, the site of an early HADAS excavation which yielded some Roman pottery. As already announced, it is proposed to continue this river walk on Boxing Day morning, when the area north of Burnt Oak will be explored. A preliminary propitiatory offering to the weather gods/goddesses is recommended! Was early in 1973 that HADAS first considered the possibility of encouraging our local council to reactivate a policy (begun by Hendon Corporation in 1957) of erecting .blue plaques on historic houses and sites in the area. By June 1973 we felt ready to call a meeting of other societies in the Borough who might be expected to sympathise with such a project. These were the Mill Hill and Hendon, Historical Society, The Barnet & District History Society and the Finchley Society. We all met (two representatives of each society) in July at our then secretary's house, under the chairmanship of Brian Jarman. We agreed to set the ball rolling by sending a letter to the Town clerk. As a result the General Purposes Committee of the Council agreed in principle, on 15th October 1973, to the erection of,commemorative plaques at suitable sites, to a maximum not exceeding 10 plaques in any one financial year. The sum of £600 was to be included in the Council's draft estimates for 1973/4, & also in future financial years, for this purpose,. Ah, halcyon days! We need not recount in detail the whole sorry story since then, covering as it does-financial freezes, the invocation-of the Edward Harvist Fund, the steep rise in costs of ceramic plaques and their installation the exploration of other more reasonable types of plaque, the discussion of the pros and cons of vandalism against such memorials, the halving of the original list of ten and many other factors which upped (if a factor can up) and. hit us. The first of these to be unveiled, with a special dedication service, will mark the centenary of the Christ Church URC. It will commemorate the Church's founding congregational minister, Benjamin Waugh, who also co-founded, at the time he was working at Christ' Church,a movement which was later to become the National Society for the Prevention ,of Cruelty to Children. The ceremony is timed for 3p.m, on January 15th, and will be attended by the Deputy Mayor of Barnet, representatives of the NSPCC, Benjamin Waugh's granddaughter and possibly other members of the family. HADAS members living nearby may care to add lustre to the occasion and to inspect the 'fruits of one of the Society's labours! Christ Church itself is a highly ornate structure of red brick, date 1909 and so built the year after Benjamin Waugh died in retirement at Westcliff on sea. There is, however, one buildingjn the complex at Friern Barnet Road which is contemporary with Waugh:-the church hall, behind the church. It faces onto Bellevue Road & was built-in 1883, its foundation stone (as recorded on the building) being laid by Samuel Marley. A few facts about Benjamin Waugh himself may be of interest. He was born in Settle, in Ribblesdale, of.Yorkshire parents on both sides. After a private education he went into business at the tender: age of 14, but at 23 decided to enter Airedale College in,Bradford to train for the congregational ministry. After serving as minister at Newbury and the at Greenwich, he came to New Southgate for four years in the 1880s. In 1887; .at- the: age of 48, he retired from his ministry to devote himself exclusively to philanthropic labours". He had, from the late 1860s, been particularly drawn to work for neglected and ill-treated children. He founded a day-care institution for vagrant boys, whom he called "the Wastepaper and Blacking Brigade" For over 20 years he edited the Sunday Magazine, using its pages as a platform for pleading the cause of misused children, and from the time of the 1870 Education Act he served for 6 years as Greenwich representative on the London School Board. At this time a lady named Sarah Smith, who had taken the pen-name Hesba Stretton (she thought her own name insufficiently distinguished for a would-be author), was producing a flood of fiction, mostly short religious and. moral tales concerned with the woes of children. Her most famous offering was "Jessica's First Prayer" which sold over a million copies and was translated into many languages. She met Waugh through the stories she wrote for the Sunday Magazine; and together in 1884, they established the London Society for the Prevention of Cruelty to Children. Waugh was clearly a forerunner of today's ecumenical movement; when the London Society became a national one in 1888; it was with .a non-sectarian constitution for which Waugh obtained the approval of the Bishop of Bedford, the Chief Rabbi and Cardinal Manning. He and Manning (who also had links with our Borough, having been born and lived the first seven years of his life at Copped Hall, Totteridge) had, in fact, collaborated earlier by preparing a joint article for the Contemporary Review, under the title, "The Child of the English Savage'. The name National Society for the Prevention of Cruelty to Children was not adopted until 1895, when a royal charter was granted. Benjamin Waugh was the first paid director of the NSPCC, serving from 1895 until his retirement in 1905. Waugh who had a quiverful of his own: 3 sons and 5 daughters-had a profound influence on the legislation regarding children which was passed around the turn of the last century. The Act of 1889 for the prevention of cruelty to and the better protection of children was mainly due to him. The act recognised the civil right of children to be fed; clothed and properly treated. Under its provisions a child could be removed from parents who grossly abused it, and could be entrusted to relatives, friends or to an institution; the offending parents, however, had to contribute to maintenance. Other Acts, stengthening the position of children, were to follow in 1894, 1904 and 1908. The plaque that is to be unveiled this month in Barnet won't, by a long chalk, be the only commemoration of Benjamin Waugh. There is a plaque in Settle, his home town, on a building which is now the Trustee Savings Bank and a green plaque at Southend on the house in which he was living at the time of his death. There used to be a silhouette-type plaque on NSPCC Headquarters in Leicester Square. When the Society moved to new premises in Riding House Street the plaque went too but it was never erected and now cannot be found. There is also said to be a plaque on a bank in Southgate, the place where he lived during his New Southgate ministry, but we haven’t tracked that one down yet. Finally, the GLC proposes to unveil a plaque next year on the house in which Waugh lived in Greenwich. References: Life of Benjamin Waugh by Rosa Waugh & Ernest Betham', 1912; The Times, March 13,14 and 17, 1908; Dictionary of National Biography, 1901-10. We hope to provide a run-down on the history behind each of these plaques in subsequent Newsletters, and to let you know when each one will be unveiled. The Committee of HADAS has, in fact, made an offer to the Borough Librarian to finance and organise small unveiling ceremonies where these would be appropriate. Our Hon Treasurer, Victor Jones, and Isobel McPherson are looking, after this aspect of the project. The 17th Conference of Local historians at the Museum of London on November 20th was a lively as ever as much on account of the audience, the exhibits and the bookstalls as because of the speakers. Anyone who takes part in this event can be in no doubt that local history in the London area is alive and kicking out in many directions. The Conference benefitted from having only 3 speakers (the comparable conference of London Archaeologists every spring suffers from trying to cram in too much) .People had time to study the stands (HADAS had an exhibit on almshouses in LBB an an excellent bookstall), meet old friends and hear about new projects. Two of the speakers dealt with types of record which are not well known to.and are therefore rarely used by local historians. Ralph Hyde .of Guildhall Library, described the parochial assessment maps of the 1830s-1840s. Most researchers rely on tithe maps for this period (the Parochial Assessment Act and the Tithe .Commutation Act were both passed in 1836). Where they exist (and sometimes the tithe map covered the whole parish so the parochial assessment map was unnecessary) the assessment maps provide much detailed information. Mr. Hyde encouraged his listeners to go forth and try to find such maps for their districts: the parish church or vestry would be the best starting point. He told one chastening tale of ringing up a vicar to ask if he could look at the parochial assessment map. "I don't think we've got one" was the reply. "I believe you may have persisted Mr, Hyde. "I've never seen it - where do you think it is:" asked the Vicar "One of your parishioners says it's hanging on the wall over the telephone" said Mr.,Hyde. "Why, bless my soul so it is!" The other type of document, dealt with by MR J D Gerhold, concerned the papers of the-Chancery and Exchequer courts,, to be found at the PRO in Chancery Lane (not KEW). These courts offered a remedy for those who could find no remedy in the common law. In Chancery cases were mainly on secondary matters in Exchequer 'on more important subjects Primarily, both were concerned with the land they contain detailed depositions on topography, parish matters, land improvement, walls, manuring, manorial customs, con­ditions of fields and. roads, inns, etc. Unfortunately they are tricky and slow to use; being filed not by place, but by person concerned. Unless you are chasing an unusual name you may have problems. In the 1930s at the Whetstone turnpike, near the county boundary of Middlesex and Hertfordshire, there was on average one vehicle each way every two minutes: nearly 1000 vehicles a day paying toll. Further south the building of the road to Marylebone - Ballards Lane/Regents Park Road/Finchley Road - in 1825 took some of-the southbound traffic. The remainder continued across Finchley Common. One interesting sidelight on that notorious stretch of road was that the activity of highwaymen had diminished considerably after 1797, when banknotes began to be numbered. Reports of Parliamentary commissions on turnpike roads and on the Holyhead road. Two new sets of post cards have just been published by the Libraries Department as part of their continuing series now available are (price 30p per set), five more cards each picturing Hendon and Barnet in the 1890s/early 20c. The Hendon set features Church End, St.Mary's. Church, Bell Lane, Town Hall and Hendon Central Station. The Barnet set, High Street, Ravenscroft Park, the Red Lion, and Arkley Mill. Two more sets covering Edgware and Mill Hill Village will be published soon. The postcards-are available from all Barnet Libraries and Church Farm House Museum.